Inventory is a dynamic thing by its very nature and when it becomes necessary to make changes, Storman is up to the task. This article is useful for when you want to adjust inventory levels within Storman to match what you actually have in stock. During the below process you will be adjusting incorrect inventory levels. 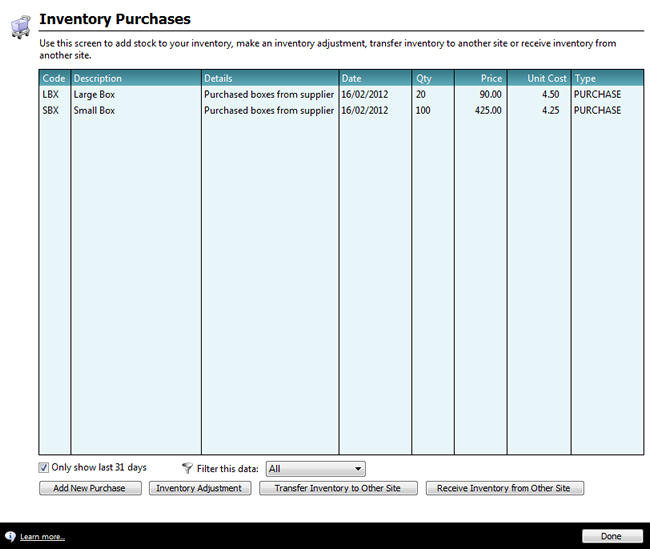 Navigate through the Accounting menu to Inventory Item Purchases, Adjustments and Transfers. Highlight the Item you wish to adjust and select Inventory Adjustment. Note: Before you adjust inventory levels, we recommend you first check the Inventory Item Inquiry section and / or use the Inventory Count Form to see if the stock levels in Storman are indeed incorrect. If your stock levels in Storman show too many (compared to real life), put through a negative-quantity transaction. For example, select your stock item type from the dropdown, set the quantity as '-10' (if Storman is showing 10 too many). If your stock levels in Storman show too few (compared to real life), put through a positive-quantity transaction. For example, select your stock item type from the dropdown, set the quantity as '10' (if Storman is showing 10 too few). Important: The difference between Adjustments and Purchases is that purchases are done when physical stock enters the system, whereas Adjustments are ad-hoc changes as a result of variance of actual stock on hand and Storman. When done, click OK to save & close and return to the main Inventory Adjustments window. Then click Done to return to the main Storman screen.